Reader Pam Anderson had a great question after trying — and failing — to find a truly archaic legal term in her pocket copy of Black’s Law Dictionary. Oh, boy, does The Legal Genealogist have an answer to that! First off, a brief explanation of this tome. Many of the terms it defines are critical to the records we work with day in and day out as genealogists. 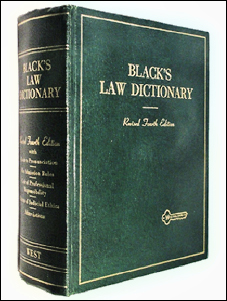 Let me put it this way: if a legal term you’re trying to figure out isn’t in Black’s, then it’s probably spelled wrong. But, as Pam found out, the question sometimes is — in which version will you find it? That breaking point for the oldest legal terms was after the Fourth Edition. There were at least three printings of the Fourth Edition — in 1951, 1957 and 1968 — each with 1882 main pages and a varying amount of preamble material. It’s sometimes called the Fourth Edition, sometimes the Fourth Edition Revised, sometimes the Fourth Edition Deluxe or even the Fourth Edition Revised Deluxe. But that edition, with its 1882 pages, is the last edition with all the terms we want. The Fifth Edition, published in 1979, is a fundamentally different publication — and not suited for our purposes. If you absolutely positively have to have a physical book version of a dictionary, this Fourth Edition is the last one to try to find — and it won’t come cheap. Amazon has some copies in its marketplace from third party sellers; the cheapest version this morning is $73.01. There was one on eBay where the auction won’t close for another five days, and bidding was already at $50 — or you could buy a second one for a flat $255. I personally recommend that genealogists buy and use the first version, published in 1891. It’s the one written closest to the time that the records we usually work with were created, so the language will be closest to what the record-creator meant. Again, if you just have to have a physical copy, you can have your very own copy of a reprint in hardback from Amazon. It’s only $195 new — or you can save a whole $2 by buying it used (for $193). Or you can do what I did. I bought the CD version from Archives CD Books USA. For $29.95, you get both the first edition (1891) and second edition (1910), fully word searchable. Best buy you’ll ever make. And if you absolutely can’t scrounge up the money right now, you can find this dictionary online. HathiTrust has the 1891 edition, albeit in a form that’s not the easiest to use, while Internet Archive and Google Books have the 1910 (second) edition free. fourth editions Because I purchased it my first year of law school in 1975. Hope you have the right one! Thanks for answering that question Judy. Now we all know which version we need. I’m reading that 96 page Chancery court case document I found on the Virginia Memory site and certainly see terms I’m not familiar with. I couldn’t function without my copy, Diane. They really don’t teach this stuff in modern law schools! So I’m obviously missing something here. If I can download the PDF version of the 2nd edition from Google Books and search the first edition online , even the 2nd edition albeit well stocked with ads, why would I want to purchase them on CD. Must be some features I wouldn’t get otherwise. Please expound further. The big reason is to have them available at all times under all conditions, even when what you need is only in the first edition… and your internet connection is down. Thank you, Judy, for the info on the cd. I would have purchased a hard bound copy and I really dislike doing that. A cd is much more space friendly! I find the CD version is REALLY handy! Good question! Swiped for a future blog post! Hi! I just wanted to let you know that this post and the next one, giving similar resources for England, Australia, and Canada, have been included in my NoteWorthy Reads post for this week: http://jahcmft.blogspot.com/2015/03/noteworthy-reads-8.html. Thank you for this; it will be very helpful! dition. Know where I can go?